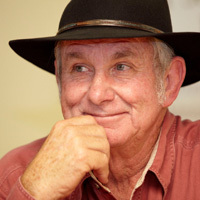 Angus Buchan is an honest and sincere South African farmer of Scottish descent. His gentle but uncompromising faith has carried him through droughts, financial crises and family tragedies. He has seen God perform miracles and wonders to provide and heal. When God called him to preach the gospel, he did not hesitate to obey, and his obedience has lead to a powerful ministry around the world. In 1980, he started the Shalom Ministries to preach in his local community. Over time he has become a full time evangelist whilst the farm is now owned and being run by both his sons. In 1998, Angus wrote a book about his life, Faith Like Potatoes, the book was turned into a film of the same title in 2006. The Bible to be the inspired, the infallible, authoritative Word of God. In the Eternal Triune God. That for the salvation of the lost and sinful man, regeneration by the Holy Spirit is absolutely essential. In the resurrection of both the saved and the lost; they that are saved unto resurrection of life, and they that are lost unto the resurrection of damnation. In the creation, test and fall of man, as recorded in Genesis; his total spiritual depravity and inability to attain to divine righteousness apart from God.